In spring of this year when oil prices had rebounded and apparently stabilized around $60 per barrel, American shale drillers breathed a sigh of relief. While far below the $100 price levels their businesses had been built on, it was a vast improvement over the mid-$40 price range seen at the bottom of the market. Here are some ways companies are enduring survival mode. Coinciding with the period of high unemployment following the global financial crisis, employment in the oil and gas sector has surged in recent years on the back of the shale boom. While overall employment in the industry remains high, data from the Bureau of Labor Statistics (BLS) shows that numbers have dropped off fairly significantly. 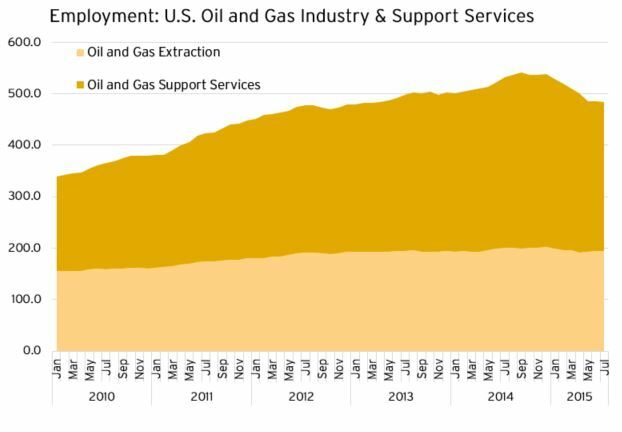 The two categories of employment that BLS tracks, employment in “oil and gas extraction” and “support activities for oil and gas operations,” have both tapered from their peak in September 2014, in the early days of the oil price rout. During that month, 540,800 individuals were employed in those sectors. Now, with combined employment at 484,500, that suggests a decline of 56,300 jobs, or just over ten percent of the total. According to energy recruiting firm Swift Worldwide Resources, the United States has seen the most dramatic layoffs, but the industry is in fact hurting all over the world. The firm pegged global layoffs at over 150,000 in June of this year. While the industry’s layoffs have no doubt disrupted countless households, widespread cutbacks have a broader impact on oil and gas companies in the longer term. 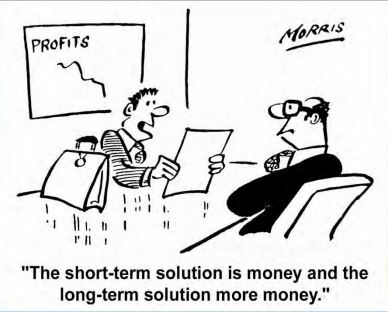 For example, many companies will speak of a “lost generation” of engineers following massive layoffs during a sustained low oil price environment, which is what occurred in the 1980s. When companies fire workers to maintain their balance sheets in the short term, they risk losing valuable human capital for the next upswing. Earlier this month, Bloomberg reported that cash-strapped energy companies are selling oil fields as their last resort to weather the price collapse. 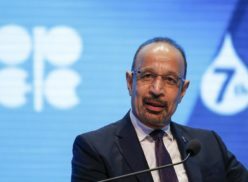 According to data compiled by Bloomberg, companies including Anadarko Petroleum, Comstock Resources, Occidental Petroleum, Whiting Petroleum, Exco Resources, Chesapeake Energy and Ultra Petroleum have all said in recent weeks that they are exploring asset sales, if they are not already underway. 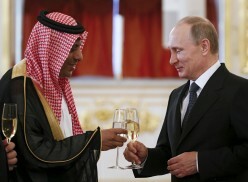 Selling oilfields and other assets are largely an effort to appease creditors. Industry is in a position where it’s nearly impossible to raise revenue—oil prices are outside their control, and many fields are not currently economical to drill. Thus, they are forced to raise capital while tightening their belts. But that is not always enough for companies with large outstanding debt, now that companies are losing access to capital markets and cost-cutting has basically been exhausted, according to Bloomberg. Even with oil prices around $60 per barrel during Q2 of this year, shale-focused companies including Occidental Petroleum, Continental Resources, and ConocoPhillips have each slashed spending by over 40 percent in the current environment, dampening the likelihood of a rebound in U.S. production in the near term. Shale, and oil production in general, is a highly capital-intensive industry. According to data drawn from company reports and SEC filings, capital expenditure has dropped dramatically across the board. 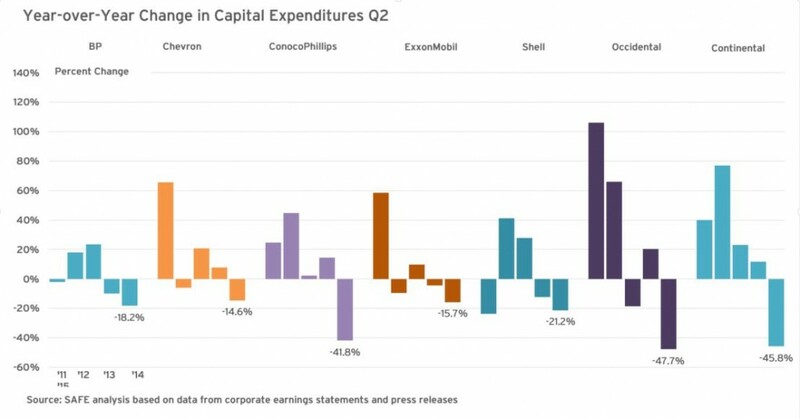 The oil majors including BP, Chevron, ExxonMobil and Shell have trimmed spending, generally cutting 20 percent or less of Q2 spending since last year. Even with oil prices around $60 per barrel during Q2 of this year, shale-focused companies including Occidental Petroleum, Continental Resources, and ConocoPhillips have each slashed spending by over 40 percent in the current environment, dampening the likelihood of a rebound in U.S. production in the near term. It’s been said more than once that the shale boom was built on cheap credit. Now, the easy debt that fueled the shale boom threatens to bring down many of the companies it helped build. 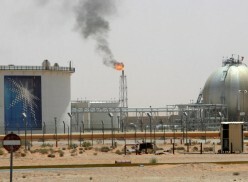 Credit ratings agencies have come down hard on distressed drillers—the S&P assigns a “junk” rating to 45 out of the 62 companies in the aforementioned Bloomberg Index, while Moody’s Investors Services says 7.4 percent of U.S. oil producers are likely to default over the course of the next year—up from a previous projection of 2.7 percent. Bloomberg pegs total driller debt at $243 billion as of the end of Q1 2015, and says that the companies in the Bloomberg Index spent $4.15 for every dollar earned selling oil and gas in the same quarter. One year ago, drillers were spending $2.25 for every dollar earned. In a particularly salient analysis from May of this year, David Einhorn, a hedge fund manager known for short-selling Lehman Brothers in 2007, recently gave a presentation about debt issues and investment risks in the shale patch. 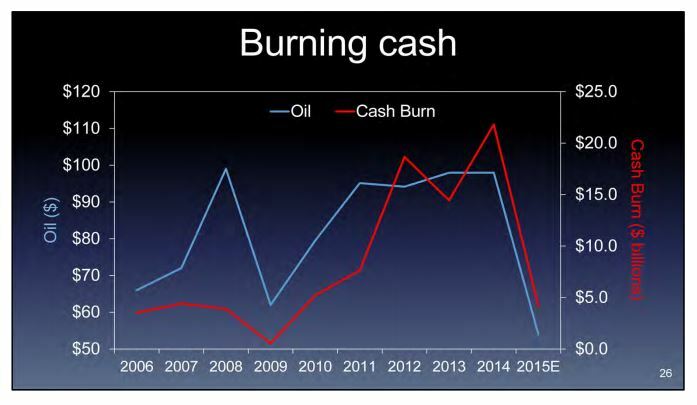 His analysis estimates that 16 oil companies alone have spent $80 billion more than they have received since 2006, and argues that “Wall Street greased the skids by underwriting debt and equity securities that allowed [drillers] to garner billions in fees.” Einhorn also questions if investors were furnished a clear analysis of company returns, given the scope of the accumulated debts, and points to disingenuous disclosure of its recoverable vs. proved reserves from Pioneer Natural Resources. The same 16 companies that outspent their earnings by $80 billion drilled an accumulated $325 billion worth of wells, but even when oil prices were at $100 per barrel, none of them generated excess cash flow, he points out. Banks happily supported the fracking industry because revenues were high (with $100 oil prices). Unfortunately, the oil and gas industry functions differently from typical businesses where investment spending supports a durable asset and a recurring revenue stream. In Einhorn’s words, “Capex goes towards reducing the assets one barrel at a time.” Right now, capital expenditures have been cut dramatically, but production is no longer growing—a challenging dynamic for companies across the board, and one that many will be forced to answer to as price hedges continue to drop off.